Register today by calling the Circulation Desk (504-568-5550) or by emailing reference@lsuhsc.edu. Don’t forget to come to the Isché Library today between 11:30 am and 1:30 pm for the Shin-Dig! 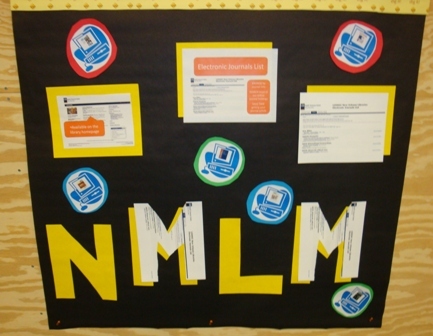 Well, we?óÔé¼Ôäóve reached the end of National Medical Librarians Month, and as things draw to a close we?óÔé¼Ôäód like to focus on one more new resource with which you are already familiar: the new and improved E-journals list. Due to various reasons, the list is not a comprehensive listing of the electronic journals we have, but it?óÔé¼Ôäós relatively close. The list requires login to WAM for off campus access. 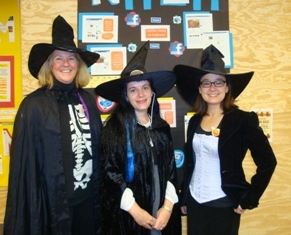 The Isché Library will be hosting a Halloween Shin-Dig from 11:30 am to 1:30 pm on Friday, October 31st. Hello again from the NMLM Committee. We?óÔé¼Ôäóre halfway through this whirlwind staff development course ?óÔé¼ÔÇ£ thanks for hanging in there! 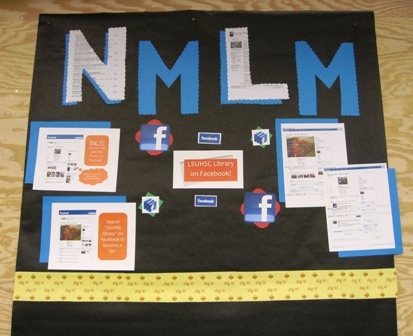 This week we?óÔé¼Ôäóre exploring social networking and the library?óÔé¼Ôäós Facebook page. Social Networking sites are online communities where people can connect with their friends and discover other people who have similar interests. Often social networking sites have features that allow users to interact with each other through features like photo sharing, chat, messaging, group invitations to events and more. Popular social networking sites include MySpace, Facebook, and Linkedin. The Dental library and Isch?â?® library both have a page on Facebook. Facebook members can become ?óÔé¼?£fans?óÔé¼Ôäó of the libraries, which allows you to leave comments, see events, view pictures, and more. View to the library facebook pages. Are you a member of Facebook? Add the library as a fan and leave a comment on our Wall about what you?óÔé¼Ôäód like to see on the library Facebook page. Not a member of Facebook? If you do not want to create a profile in Facebook, leave a comment on the library blog post for this week ?óÔé¼?ôCan ya dig it? : social networking at the library?óÔé¼?Ø about what you?óÔé¼Ôäód like to see on the library Facebook page. Register by calling either the Isch?â?® or Dental Libraries’ Circulation Desks (504-568-5550 or 504-941-8158) or by emailing either reference@lsuhsc.edu or dentlib@lsuhsc.edu. Think about how you save web pages you visit frequently. Most people are aware of the ?óÔé¼?£Favorites?óÔé¼Ôäó feature on Internet Explorer (or ?óÔé¼?£bookmarks?óÔé¼Ôäó in FireFox). You find a page you want to remember, store it in your ?óÔé¼?£Favorites?óÔé¼Ôäó, and use that whenever you want to visit or remember a favorite website. When you add a page to your ?óÔé¼?£Favorites?óÔé¼Ôäó on a web browser like Internet Explorer, it is stored in your computer. If you use multiple computers you may have different bookmarks saved on different computers. Check out three more opportunities to learn! Register today by calling either the Isch?â?® or Dental Libraries’ Circulation Desks (504-568-5550 or 504-941-8158) or by emailing either reference@lsuhsc.edu or dentlib@lsuhsc.edu. 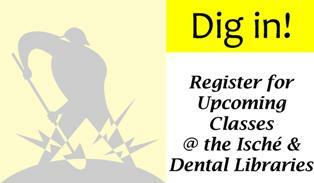 Library Classes – Tomorrow – Dig In! Two classes are being offered tomorrow (Wednesday, October 8th). The General Library Systems Class will be held from 9:30 – 11 a.m. at the Isché Library. And Navigating E-Journals Class will be held at the Dental Library from 12 noon to 1 p.m.
Sign up now for either class by calling the Circulation Desk at either the Isché or Dental Libraries (504-568-5550 or 504-941-8158). 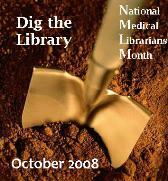 October is National Medical Librarians Month. In recognition the library is doing a staff development activity to learn about some of our newer online tools. Here is week 1’s assignment: Dig Deeper with Blogs. ?óÔé¼?ó	Definition: BLOG is short for Web log, or an online journal that is frequently updated with news, views or other information. ?óÔé¼?ó	You can view our library blog, LSUSHSC LIBRARY NEWS, on the Isch?â?® Library homepage. All library staff can create posts on the blog or leave a comment. Haven?óÔé¼Ôäót used our blog before? Anyone can create a username & password to comment. Enjoy our ongoing efforts to dress up our plywood construction walls. Stay tuned for more! 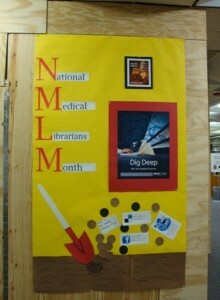 The LSUHSC Libraries will be celebrating National Medical Librarians Month in October. 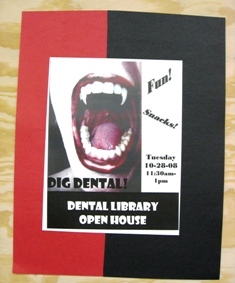 Stay tuned for class announcements, posters to dress up the Isché plywood construction walls, an open-house at the Dental Library and a Halloween surprise at the Isché Library.